Business organizations born in digital age face the challenge of achieving digital maturity and reaching desired competiveness and market relevance levels. In digital transformation era, adoption of new technologies and innovative solutions is a key part in organization’s evolution process. However, this requires effective management and use of appropriate methods and tools. One of DIGITRANS project’s activities was the development of a method framework, which supports SMEs effectively in developing and implementing new digital business models in their organizations. The method is a joint effort of the project’s consortium members who will also be involved in the preparation and implementation of blended learning sessions. The innovation phase is divided into analysis and design, which both consist of specific processes. The analysis includes the initial identification of the innovative potential of respective company or certain business case. The design process is based on the results of the analysis. It comprises the ideation, selection of potential solutions and creation of prototypes. It also includes relevant processes for digital business model transformation such as testing, development and organizational implementation. Within the transformation phase, the company needs to deal with the sustainable implementation and realisation of their digital business model idea developed during the innovation phase. 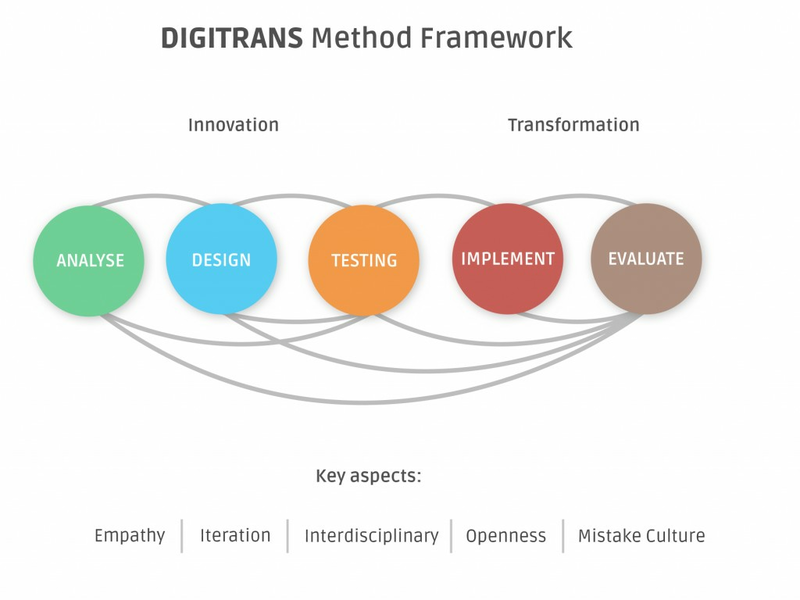 During the transformation phase, DIGITRANS trainers will provide guidelines and raise awareness on the importance of proper change management mechanisms as well as of digital culture elements within the organization. A successfully implemented DIGITRANS method will result in an approach that is more agile to the development of the products or services and help organizations to remain highly competitive in the digital economy. Blended learning trainings are scheduled to run between May 2018 and April 2019 in seven partner regions. The training itself, which will be developed for the e-learning platform, will be completed by March 2018. Please subscribe to our newsletter at the bottom of the main page and stay informed about our future activities.